Funding provided to small- and medium-sized businesses in Ontario's rural and northern communities through the Community Futures Program has generated significant economic and employment growth, according to a new Conference Board of Canada report released today. The report, More Bang for the Buck: The Impact of CFDC Lending on Ontario's Economy, assesses the economic impact of the lending services provided through the Community Futures Program. It finds that, for every dollar of lending through the program,Ontario's real GDP is lifted by as much as $4.50. Every dollar of lending through the Community Futures Program results in as much as $4.50 added to real GDP. From 2009-2014, the program provided a cumulative $398 million in loans to small businesses in Ontario. The Community Futures Program lending service helped offset some of the effects of the recession, boosting employment by roughly 3,300 in 2010 and 2011. "The fallout from the 2008 recession has revealed just how important access to credit is to the health of the global economy. The findings suggest that the program generated significant economic benefits, helping boost labour income, consumer spending and corporate profits," said Pedro Antunes, Deputy Chief Economist, The Conference Board of Canada. From 2009-2014, the Community Futures Program, which is meant to ease credit conditions for small- and medium-sized businesses in Ontario's rural and northern communities, provided $398 million in direct loans. The impact of lending on overall capital investment is significantly increased through additional funds raised from owners' equity and third-party lenders. A total of $1.142 billion in new capital investment funds were raised—with over $746 million in spending due to investments from owner's equity and funds borrowed from third-party lenders. This new investment added an estimated $1.69 billion to Ontario's economy and created an average of 3,370 jobs. Over the six-year period examined, federal and provincial governments benefited from a cumulative $281 million lift to personal income taxes and indirect taxes. 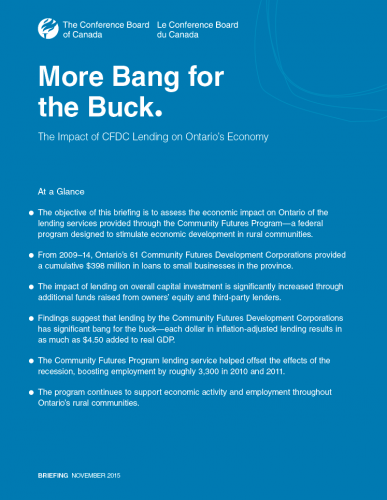 The report, More Bang for the Buck: The Impact of CFDC Lending on Ontario's Economy, was funded by the Ontario Association of Community Futures Development Corporations, a member of the Canadian CED Network.